It is impossible to write a book about male baldness without providing at least one definition. This seemed obvious at the start. However, experience and attention to the demands of patients obliged us to ask at just what point one may properly speak of baldness. Can normality of the hair be defined? And in relation to whom? Many patients come to consult us even when it is impossible to classify them as bald. These patients seek advice simply because the hair is a little sparse. This is manifested sometimes by simple fronto-temporal recession; in others the anterior frontal line is unchanged but the hair is sparse behind, a simple decrease in density compared with the crown. 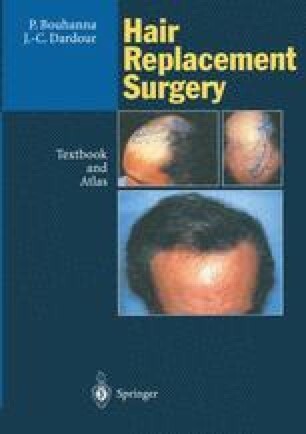 If such aspects cannot be considered as baldness, they have in common the fact that their owners will become bald in the years to come and that they already have the mental attitude of the bald; it is exactly as if the complex due to the malformation occurs before the malformation itself.